The opportunity for a student to work is a fundamental part of the University of Portland's philosophy, based firmly in the conviction that a meaningful and rewarding work experience is an educational benefit of lasting value. For this reason, the University designates significant funding each year for student employment. The University also participates in the Federal Work-Study Program (FWS). Federal Work-Study is a need-based financial aid program, funded by the federal government. It is offered to undergraduate students who complete the FAFSA and meet the Office of Financial Aid's Federal Work-Study awarding guidelines. Not all students are eligible for Federal Work-Study and students do not need to be awarded Federal Work-Study to be eligible to work on campus. 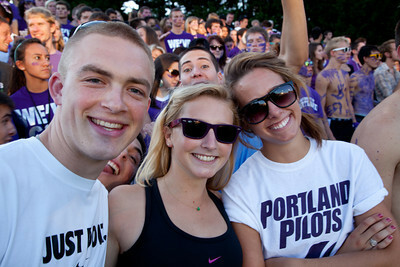 To be eligible to work, a student must be admitted to a University of Portland degree program and registered at least half-time (6 credit hours for undergraduate students; 5 credit hours for graduate students) during the current fall and/or spring semesters. Students may work during the summer semester as well as long as they are registered at least half-time in the summer semester or pre-registered at least half-time for the following fall semester. Federal Work-Study does not pay a student's bill up front, rather students are required to earn the funds and will be paid through bi-monthly student paychecks. It is up to the student to use their earnings towards educational expenses. As an added benefit for these students, Federal Work-Study earnings do not count as income when it comes time to complete the FAFSA reflecting the tax year in which you earned the wages. For more information on student employment and to explore available jobs, please visit the student employment website.